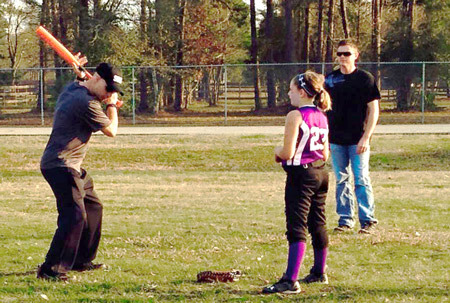 Coach Fenton, demonstrating batting techniques to one of his players, says TeamSnap has saved him hours per month. First, I need to go back to the basics: Everybody knows that coaching isn’t the easiest choice when it comes to parent involvement in sports. In fact, it becomes a JOB pretty quickly. For myself, communication with parents of pre-teen kids is a really big deal. A lot of times, there are siblings and strange job hours for them to juggle, along with an ever-changing practice and game schedule. As a coach, I pride myself on keeping everyone up to date and doing it in a convenient way for the parent. Enter TeamSnap! Before we started using TeamSnap, to inform the parents of something simple like “practice moved to 7:00,” I would have to do the following: Go to Facebook, update the event and then post on the wall that there was a change. Because some folks don’t use Facebook, I would then send out a group text saying the same thing. And yet others don’t use text much, or don’t like group texts (we all know how annoying those can be), so I would send out an email. THAT’S FOUR DIFFERENT PLACES TO COMMUNICATE ONE SIMPLE THING! TeamSnap fixed almost all of that! Now I could go to one place and simply and easily do all of the above … except text. I was still sending out those texts for instant notifications. Live! came along, and it has made all the difference. In fact, the lack of an in-app text type element was what was holding me back from signing up for a paid account. Now, I can quickly do everything I need to do to communicate with my team. For a general update of information, I simply slip into the Live! Locker Room and quickly notify everyone! Some reply if needed, but everyone sees it. The best part is, the phone notifications can be set by the parents, so it isn’t nearly as disturbing as a group text! I can’t say we use the event messaging much, but that is mainly because I have a great group of parents who are almost always present! I am certain though, there will be times when a spouse will be out of town and we will use the event messaging as well. In short, TeamSnap was a game changer, but with the introduction of Live!, it’s a whole new ball game! Because I don’t have anyone to assist me in communicating, TeamSnap and Live! have literally freed up hours of my time a month! At TeamSnap, our mission is to save coaches, parents and players time communicating with their teams, allowing them to spend more time doing what they love—coaching, playing and cheering! Hearing a story like this gives us a warm feeling in our collective tummies. Thanks, Coach Fenton!